Avocado Oil - Discover The Properties Of This Aromatherapy Carrier Oil. Nutty, Nourishing and Rich in Vitamins. Avocado oil......wonderful for aromatherapy massage because it is so beautifully rich and nourishing and penetrates well into the skin. It can be used on its own, but I never do......I find the texture a bit heavy, so I like to blend it with other carrier oils such as grapeseed oil or sweet almond oil when I am doing a massage. 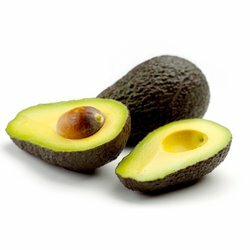 Avocado oil is often referred to as a vegetable oil.....but it is actually a fruit! This oil is quite expensive, but it is worth making sure that you find a good quality, organic, cold-pressed unrefined oil. Refined avocado oil is pale yellow so it is easy to tell it apart from the dark, olive green unrefined oil. A dark green colour with a thick feeling texture. It has quite a strong fresh, sweet and nutty aroma - not everyone likes it! Rich in lecithin, essential fatty acids and vitamins A and D.
Avocado oil is in the top 5 foods highest in Vitamin E, known for improving skin health. Very useful for skin problems, especially eczema and psoriasis. Also excellent for dry, ageing and dehydrated skins. Helps prevent chapping and cracked skin. Helps to protect the skin against the damaging effects of the sun. Its rich and nourishing nature makes it good for restoring and rejuvenating your skin. Excellent for aromatherapy massage, and of course a great carrier oil for essential oils. Fantastic moisturiser if your skin is dry, itchy and inflamed. Soothes skin after too much sun - mix together 1 part avocado oil to 12 parts aloe vera gel and gently massage onto affected area. Great for moisturising and detangling hair. Massage a couple of tablespoons into your hair, comb through, cover up with a shower cap and leave for a couple of hours. Then wash thoroughly. (You may have to wash twice). A wonderful natural make up remover - just use a few drops on a cotton wool pad to wipe off eye make up. Quite expensive with a shelf-life of about 12 months.